Creating art can be a messy business. As an artist, I can personally vouch that we need a lot of stuff. We need stuff to paint on, stuff to paint with, objects to paint, scraping tools, masking stuff, taping supplies, drawing stuff, pencils, paper, glue, cutting tools, frames, wire, hanging supplies, books, magazines, cameras, and computers, just to name a few! Do we organize it? Rarely. Right, artists? Then I had the huge task of organizing what was left. I purchased a few plastic tubs and tried to fill them according to use or subject. Pretty difficult, given that I use many items for different end products. But organize I did, as best I could, and ended up with class tubs, greeting card supplies, and collage bins grouped and easily accessible. All my notebooks for contacts, galleries, licensing, and exhibitions line the top shelf for quick reference. Show supplies are on the bottom shelf. Studio shelving organized. For now. Not bad, huh? At last, I got down to my day-to-day stuff; the supplies that I used every time I went into the studio to paint. That would be tubes of paint, paint brushes, and other supplies needed close at hand. My boys had each taken a ceramics class in high school. I inherited their self-made vases. They make perfect holders for brushes, and remind me of their high school days. The little boots were given to me as a gift. Instead of holding flowers, I use them for brushes and pencils. 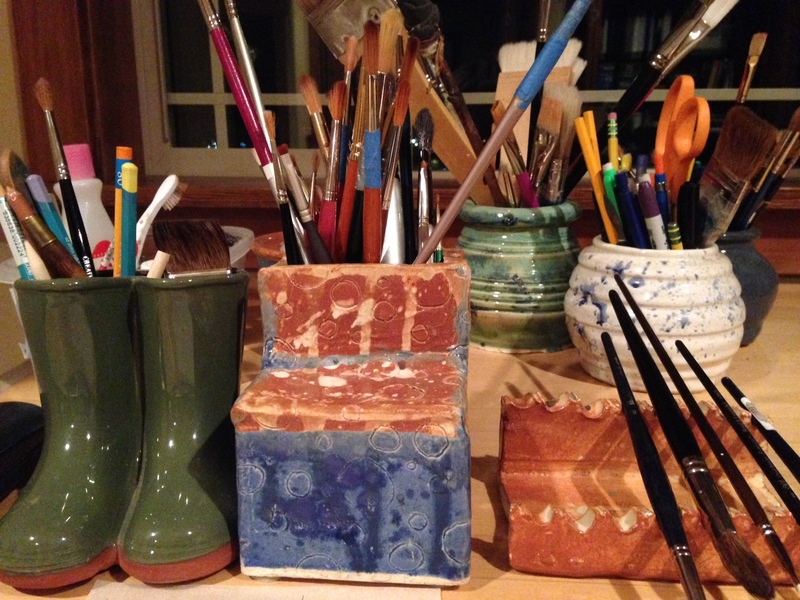 The little nifty ceramic thing to the right is something my son made me to allow my brushes to dry on a slant. Pretty cool, huh? These items always sit on top of my drafting table. I had been storing my tubes of paint in Safeway nut containers (handy little things) and old plastic tubs. This, I decided, just would not do. They were all different sizes and varieties. They didn’t stack, and, more importantly, didn’t look pretty. Right? Am I really that concerned with container beauty? 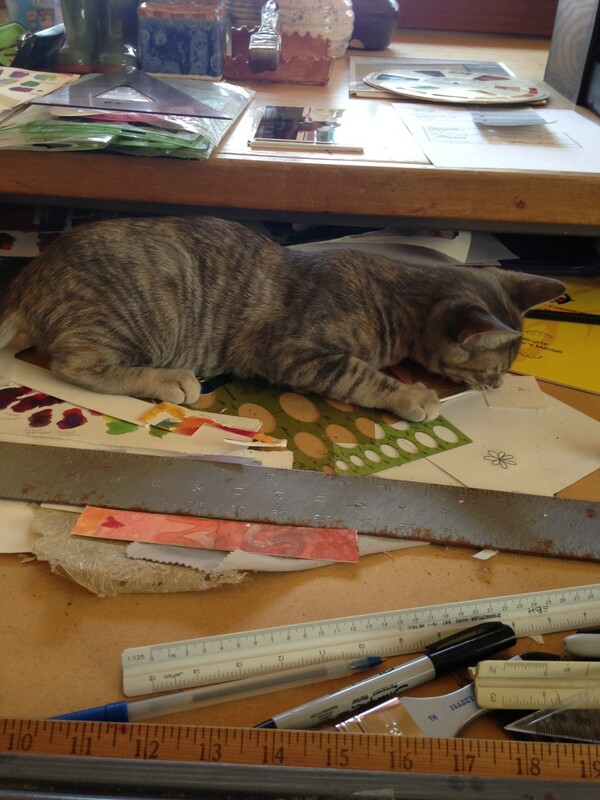 In my studio? I guess so. I ended up at a craft store nearby and came home with a prize for organizing my tubes of paint. It is a wooden box with four small drawers and a top lid. It feels old-fashioned, antique-like, and I cannot tell you how thrilled I am each time I reach for a tube of paint, to pull open a cute little drawer and select a tube of paint. It feels…I don’t know…somehow more rich and authentic!! 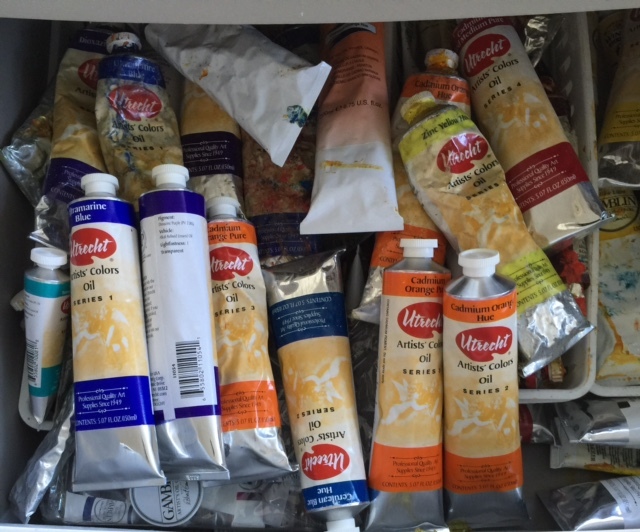 Organized paint tubes in a wooden drawer box! Neat, huh? After all this, I was curious. What did my artist friends use? Did they grab any container available? Or did they carefully select an “artsy” container that gave them joy to use? So I put out an email to them. What do you use to organize your paints? 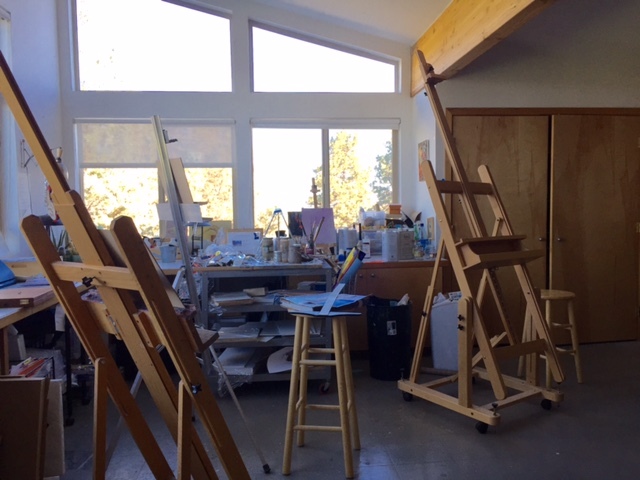 Janice’s studio. Beautiful, isn’t it!! What a beautiful studio. Ah, Janice. Amazing. See? That’s what I’m talking about. We artists use anything and everything we can. We are usually big into recycling, and as you can see by Susie’s space, she has boxes, recycled food containers, and maybe just a couple of purchased items specific for organizing. She produces amazingly creative work in this delicious studio of art supplies. It begs to be used. There is no fear here. As are her paintings: Fearless and beautiful. My friend Cindy Briggs, cindybriggs.com, an accomplished watercolor artist and instructor, has a special way of organizing her watercolor tubes. I first noticed it when we had a workshop together. 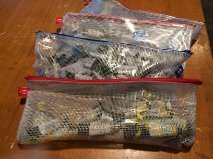 The small mesh plastic bags provide an easy-to-see, organized method for traveling with your paints. Out of these plain, unpretentious and simple plastic bags of paint arise Cindy’s gorgeous watercolors. Does it make a difference to have a beautiful organizer for tubes of paint? I can assure you that it does not, as far as painting creatively. Reaching for that tube and squeezing out the juicy color for a luscious application of pigment on a canvas is all that matters. But there is a little something that goes “ping! !” when I have depleted cobalt blue on my palette, reach for it, but instead, pull open a cute little drawer full of blues (hah…pun), and select my cobalt. It’s pleasure, people. Pleasure for beauty. What do you use? 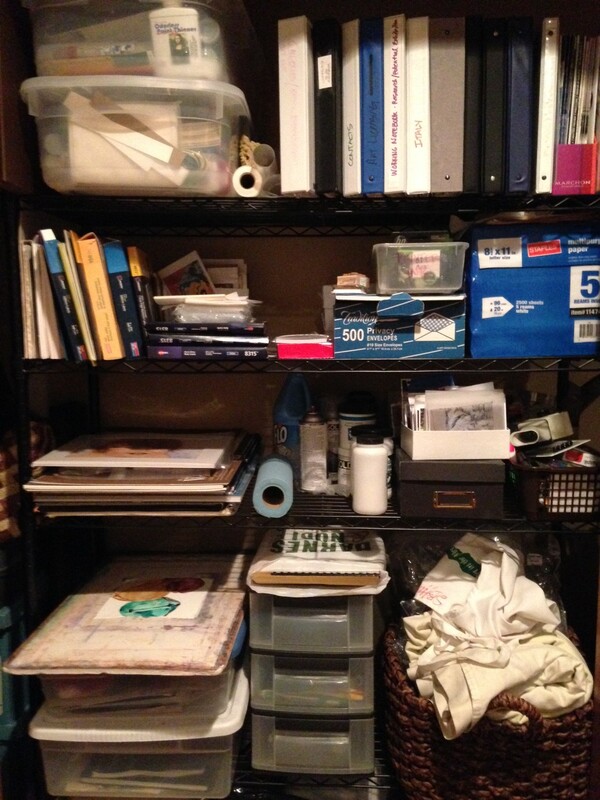 Does it make a diffence how you store your tubes or other supplies? Have you recently changed or organized? Does it work? Do you hate it/love it? I’d love to hear about your system. 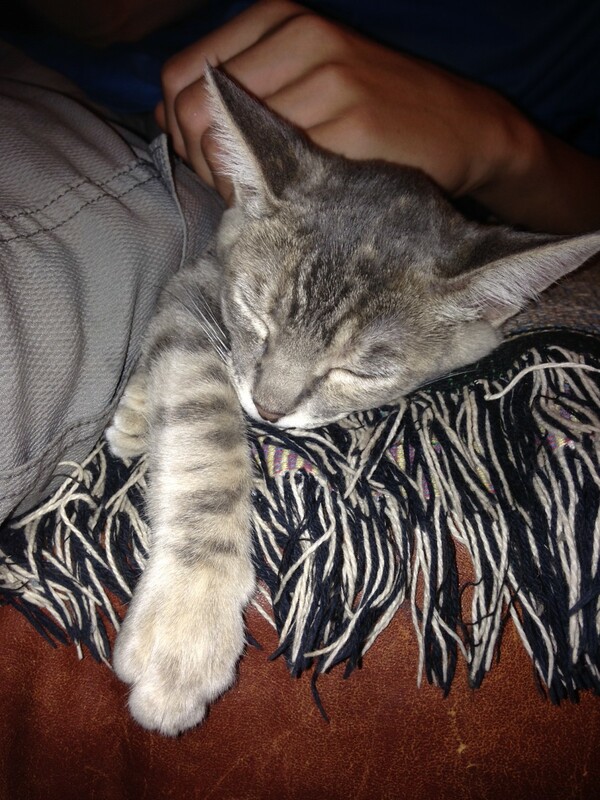 In the end, it seems I wore out my little cat. Next time, little one? My clothes closet, I promise. Exhausted from all the organizing. Cheers, everyone! Keep creating to Feed the Beast! 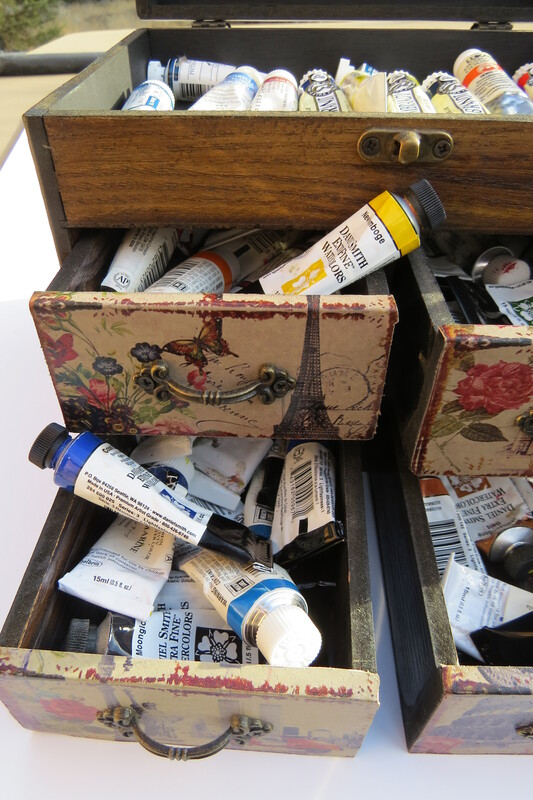 And thank you so much to the artists who sent me photos of their studio paints.